Leading UAE construction supplier to reduce CO2 emissions in concrete product by 93%. Unibeton Ready Mix, the leading UAE supplier of sustainable concrete, is working to create a pioneering product that will reduce CO2 emissions by as much as 93 per cent. Representatives from Unibeton discussed future plans at CityBuild Abu Dhabi Awards when they collected the Innovation Award for their Green and Sustainable Concrete Solutions. Unibeton’s current award winning ‘green concrete’ product already reduces CO2 emissions by 75 per cent and is being used on some major developments throughout the UAE, including Abu Dhabi’s tallest tower, the Landmark Tower, where the largest single pour of 16,000 cubic metres of self-compacting concrete was performed in the GCC. Unibeton’s green products and solutions offer significant potential to reduce verifiable emissions up to 93 per cent. During the construction of the capital’s Sheikh Zayed Bridge, completed last year, Unibeton’s green concrete product prevented 80,000 tons of carbon emissions being spewed into the air, which is the equivalent to the carbon offset of 400,000 trees. The cement manufacturing process is the major contributor of CO2 emissions in the production of concrete. By using cement replacement substitutes such as Pulverised Fuel Ash (PFA) and Ground Granulated Blast Furnace Slag (GGBS), carbon dioxide emissions are greatly reduced. The biggest reduction can be achieved while completely replacing Portland cement by industrial waste product which improves the concrete’s performance. 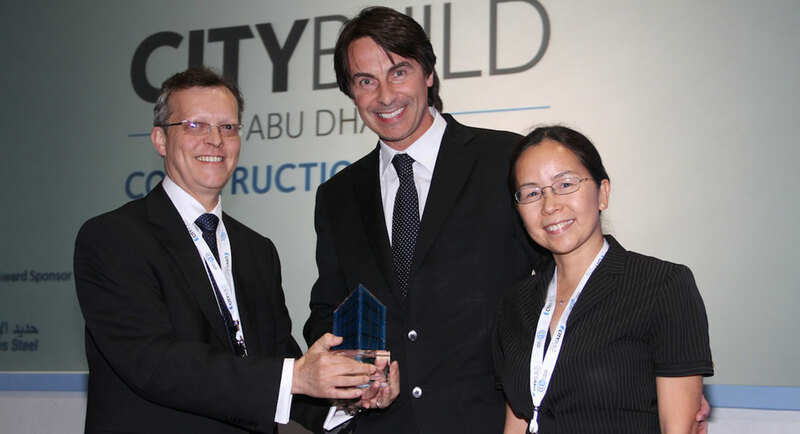 Unibeton General Manager, Dr. Jean Francois Trothier and Dr. Huiqing He, Unibeton’s Asst Operations Director were at the CityBuild Abu Dhabi Awards to accept an Innovation award. Chris Speller, Director of Cityscape and CityBuild Abu Dhabi - which is now in its third day - was pleased to hand over the prestigious award to the concrete supplier. CityBuild Abu Dhabi, which is three times larger this year than in its inaugural year in 2010, is co-located with Cityscape Abu Dhabi and, for the first time the Malaysia Services Exhibition. CityBuild Abu Dhabi is held under the patronage of His Highness Sheikh Mohammed Bin Zayed Al Nahyan, Crown Prince of Abu Dhabi and Deputy Supreme Commander of the UAE Armed Forces. The event is supported by its Foundation Partner, the Department of Municipal Affairs, Headline Sponsors BENA and Rajhi Steel, Gold Sponsor MAPEI, Official Supporters MATRADE and Malaysia Services Exhibition and Sustainable Knowledge Partner Masdar, Sustainable Partner Emirates Green Building Council and other key industry associations.